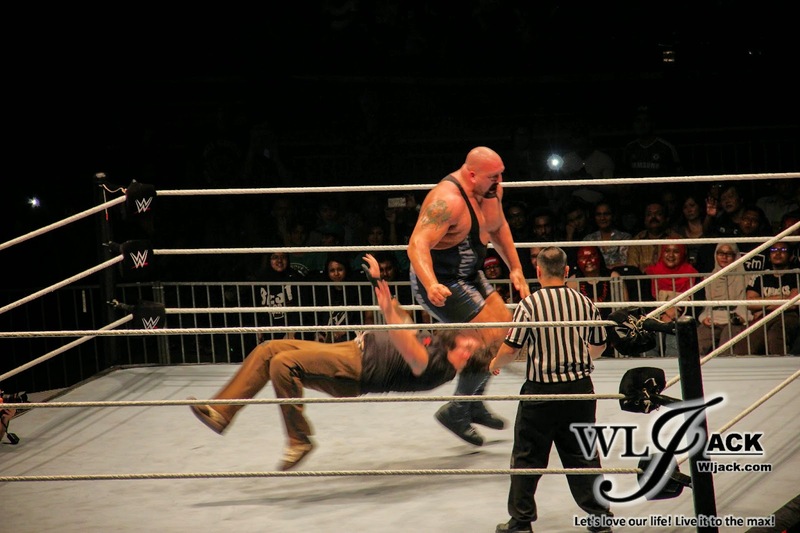 Kuala Lumpur, October 2014 – A few days ago, the beloved wrestling show, WWE Live In Malaysia 2014 has taken place in Putra Indoor Stadium, Bukit Jalil. 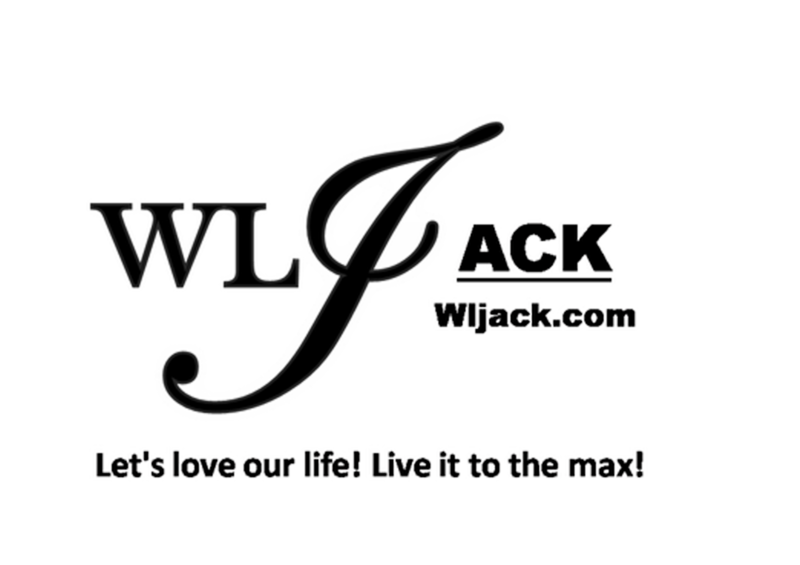 Our team from wljack.com & loong-updates.blogspot.com have been given an opportunity by Astro & Shekhinah PR to do a coverage on the event. WWE is back to Malaysia After 12 years of wait! Fans Packed The Stadium! The first time WWE has ever been held in Malaysia was 12 years ago. After 12 years of hiatus, WWE finally came back to Malaysia again with a stellar lineups of great wrestlers including John Cena, Seth Rollins, Big Show, Bray Wyatt, Sheamus, The Miz, AJ Lee, Paige, Kofi Kingston, Big E, The Wyatt Family’s Luke Harper and Erick Rowan, Sin Cara, Bo Dallas, Los Matadores w/ El Torito, Titus O’ Neil, Heath Slater, Adrian Neville & Sami Zayn. The stadium was crowded with WWE Fans which consisted of all walks of life! Most of them brought along banners and etc which were either supporting their favourite wrestlers or teasing the wrestlers which they disliked. 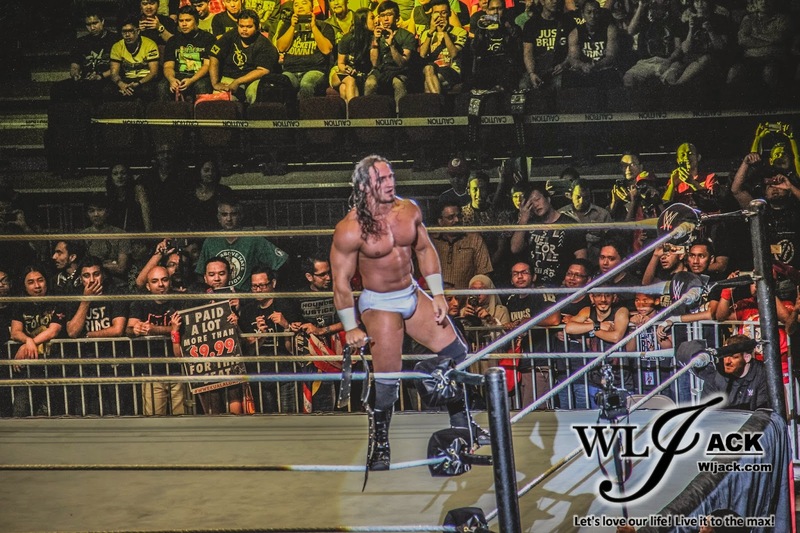 Entertaining Matches Inside The Ring! Began with tag team match! 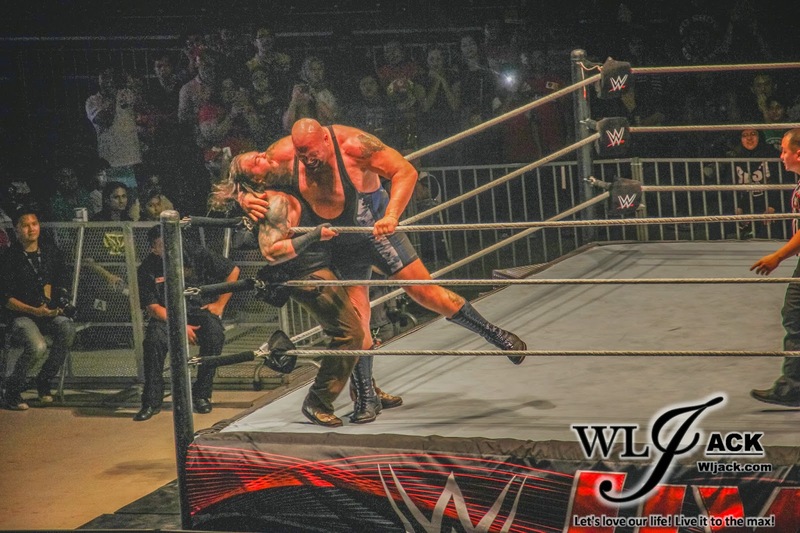 There were quite a lot of matches for the first night of WWE in Malaysia. Some of the matches were the same for both days while some were just present exclusively for each of the day. Kick-starting the show, it’s Kofi Kingston and Big E against The Wyatt Family’s Luke Harper & Erick Rowan. It was a match with great action. Eventually, Kofi/Big E team delivered a nice double team finisher and defeated Harper/Rowan. Stylish Stunts! 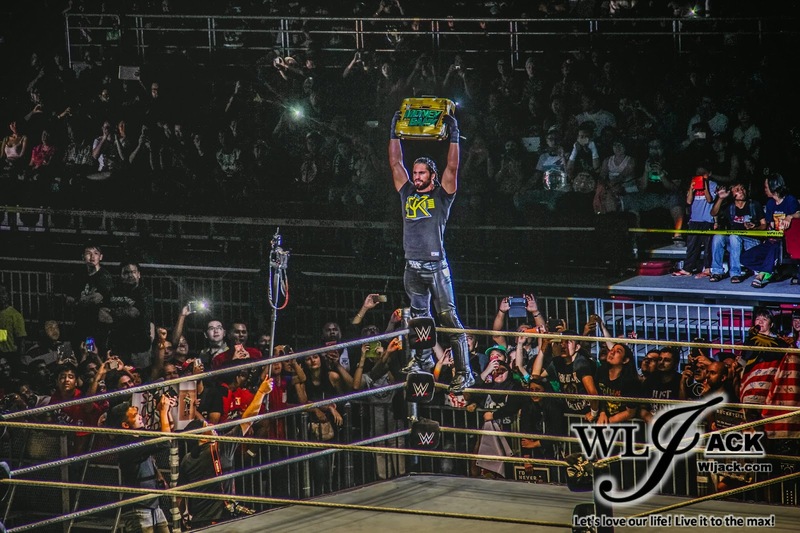 Adrian Neville and Sami Zayn Shown True Sportsmanship! 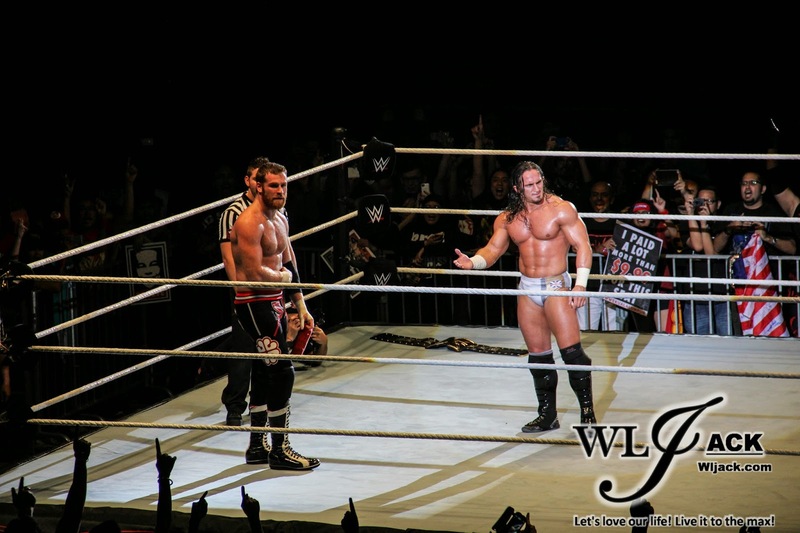 Then, it proceeded with the next match whereby Adrian Neville against Sami Zayn. Both of them have really great skills and stunts. They were jumping around in stylish ways and their actions were awesome. Adrian Neville won against Sami. The match was a really respectable one because both of them have shown great sportsmanship after the match by a firm handshake. They were requesting applause from the crowd for each other too. It was really a memorable moment! Divas Took The Stage With Both Cheers & Boo! Following Adrian and Sami’s match was the divas match between AJ Lee & Paige. The Divas has put up a great fight too and has wowed the audiences. However, Paige’s show-off attitude inside the ring has led to many “boo” from the audiences. The moment when AJ reverse grappled Paige, all of the audiences were shouting in joy! AJ defeated Paige with submission and retained the Divas Championship Title. 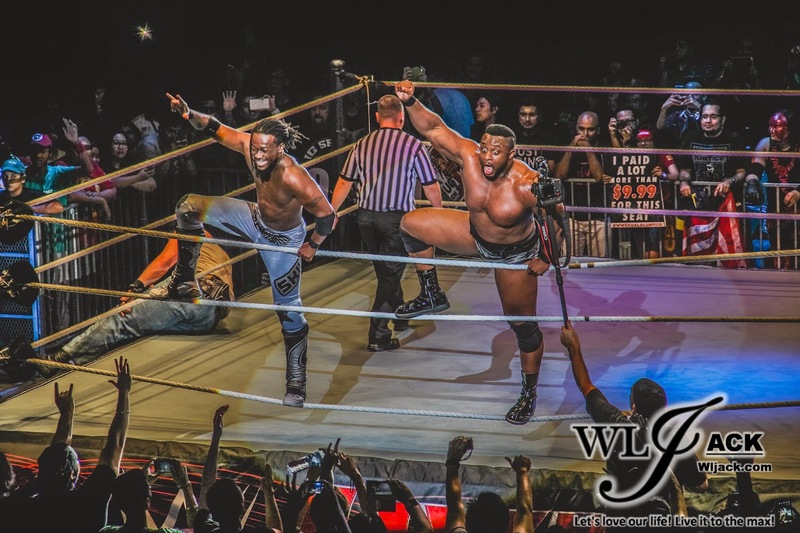 When Los Matadores with Eltorito and Titus O’Neil & Heath Slater took over the stage, the ring announcer asked the crowd whether they wanted a dance battle between the two teams or a fighting match. Surprisingly, the audiences’ preferences were more biased towards the dance battle. Thus, both of the teams danced on stage and yeah, they can dance! Los Matadores and El Torito won but eventually it turned into a fight as Titus O’Neil & Heath Slater charged towards them due to the unacceptance of their lost in the dance battle. After many chops and drops, Los Matadores and El Torito emerged as the winner of the match! Chilling Appearance of Bray Wyatt! Who’s up against him? Well, It’s The Big Show! One of the most awaited match that day would be the match between Bray Wyatt against The Big Show. 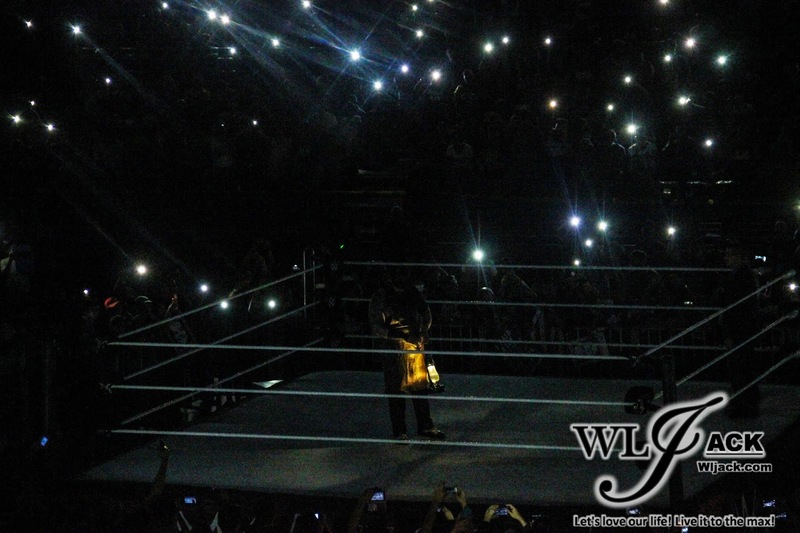 Bray came out with a chilling video introduction along with a lantern on his hand. The audiences have raised up their handphone lights too under the dark. Who’s up against him? Standing approximately 7 feet tall (210+cm), the big man came out with a giant aura! Well, it’s THE BIG SHOW! Both of them have exchanged many punches and clothlined each other before The Big Show finally won the match with his knockout punch! BOlieve It! 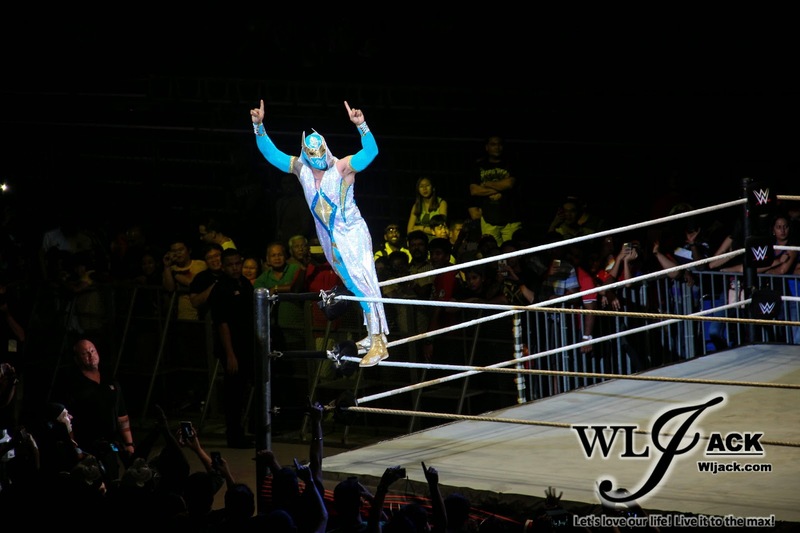 Sin Cara’s Aerial Moves! Next up, was the match between Bo Dallas & Sin Cara. Bo Dallas came on stage with a lot of his motivational quotes…which seemed pretty much ineffective to the audiences as he actually received boos instead of cheers for his planned-to-be-inspirational speech. Going up against him was the masked man Sin Cara! It was really an interesting show as Sin Cara has demonstrated many of his spectacular aerial moves while Bo Dallas put up a tight competition for him too. Sin Cara was the triumphant one in this match! 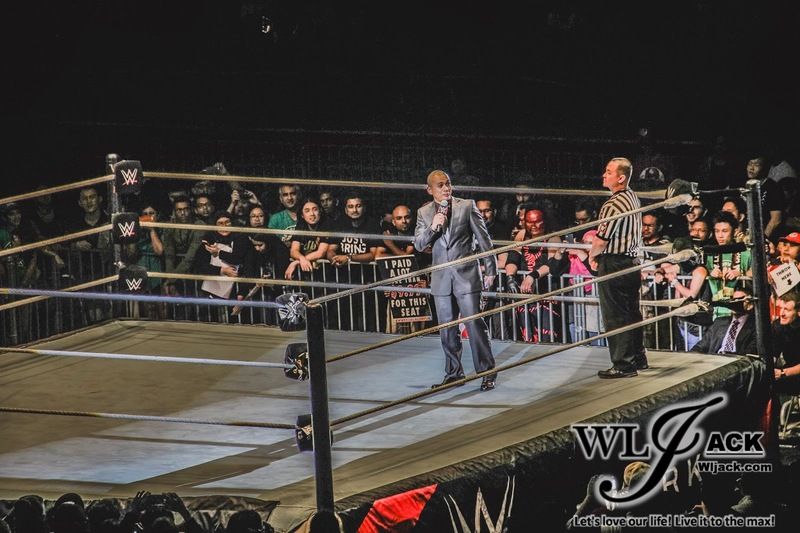 DJ Ean Came On Stage In Style As The Ring Announcer! 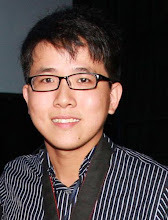 It seemed like a dream come true for DJ Ean from Hitz FM to be the guest ring announcer for the WWE Live In Malaysia 2014. His trained voice for that role was great! And yeah, most people were envy of him too for his uploaded selfie with John Cena. Such a lucky dude! But, you are awesome anyways! United States Championship! Sheamus vs The Miz! The next match featured Sheamus & The Miz who were competing for United States Championship! Sheamus retained the United States Championship! The Match Of The Night! 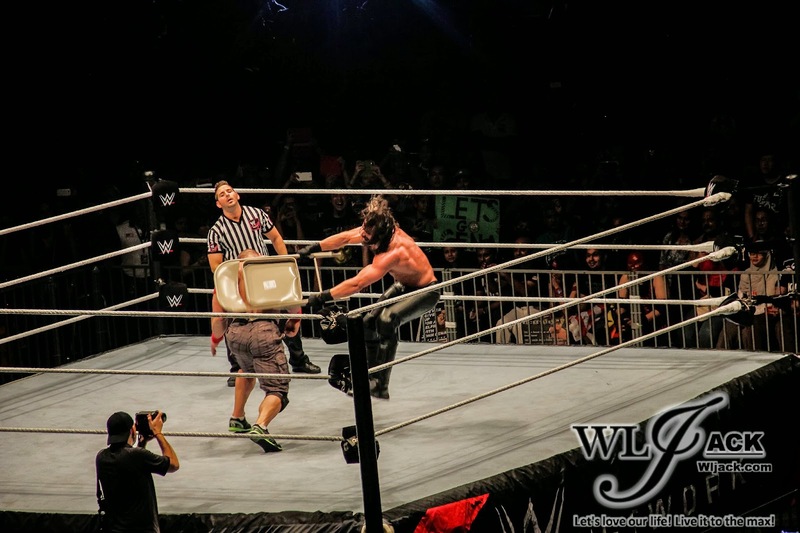 JOHN CENA Vs SETH ROLLINS! It’s finally reaching the end for the night and the last match was between John Cena and Seth Rollins! 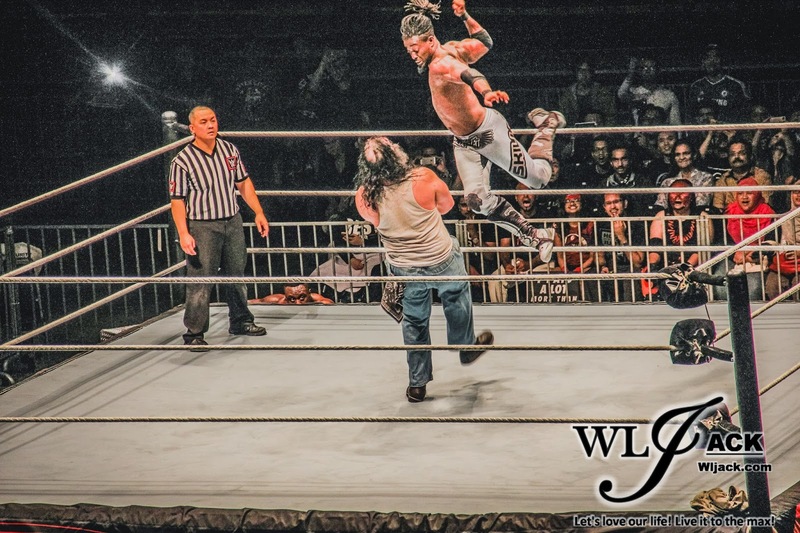 This was the most exciting match of the night because there was no disqualification for using weapons in this match! Thus, there were tables, chairs and etc being brought to the ring. If you are fans of WWE, you would be familiar with all of these weapons. It was a really great fight between both of them as both of them were tough physically and have great sets of moves. Punch, kick, drops, backbreaker, hold and etc, name any one of them, and most of them were basically present in this match. 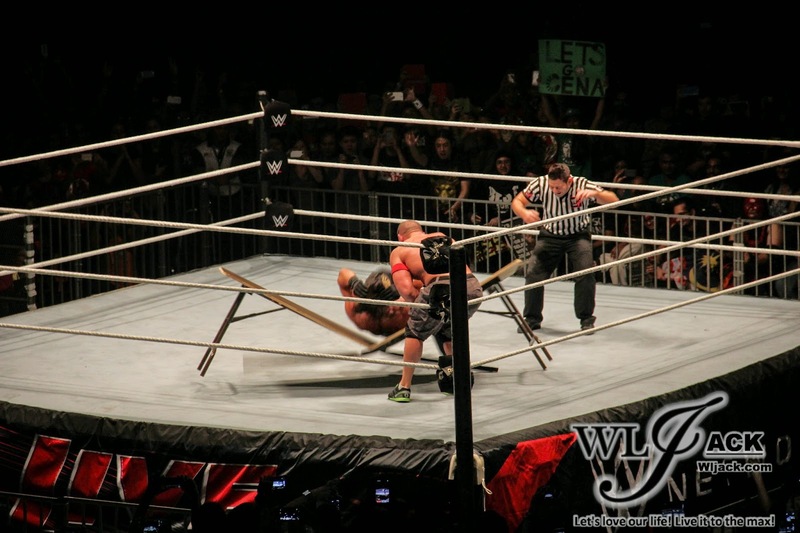 In the end, John Cena won the match with an Attitude Adjustment through a table. It was a great finishing! 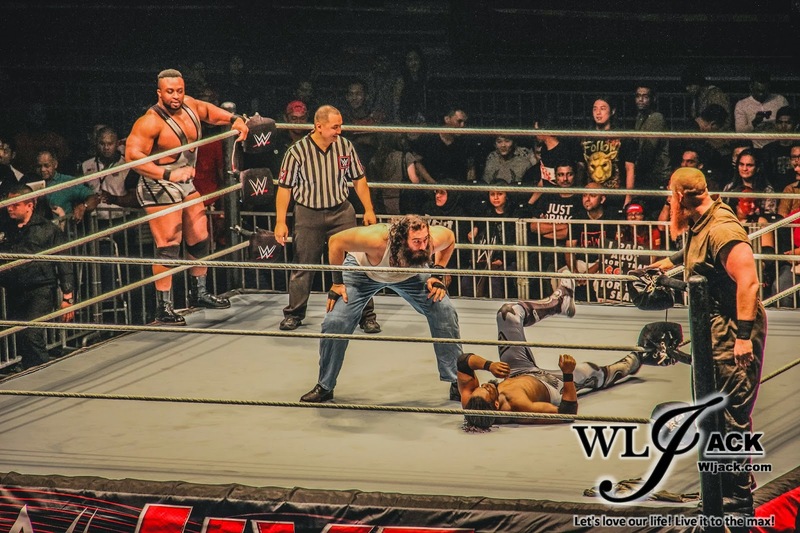 It was the first day of WWE in Malaysia 2014. 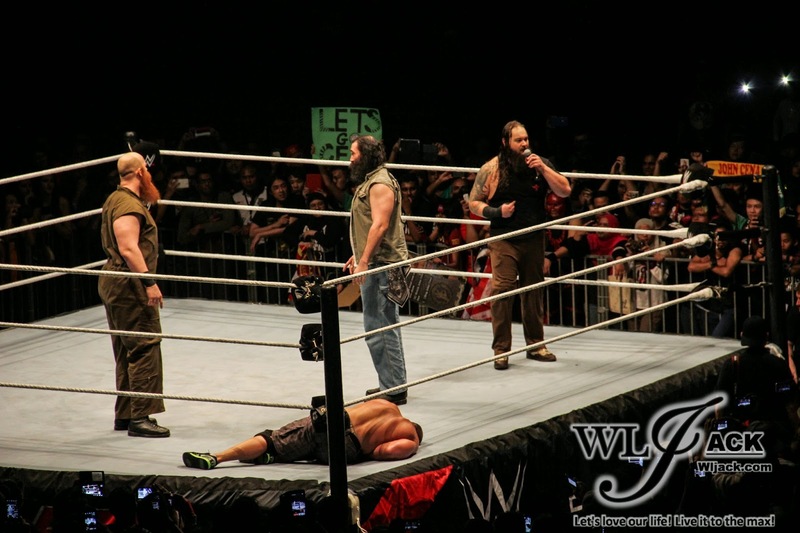 While John Cena was celebrating his victory on the ring, he was ambushed by The Wyatt Family. Big E and Kofi came on stage to help. Cena tried to fight back against Bray but he escaped from the ring. 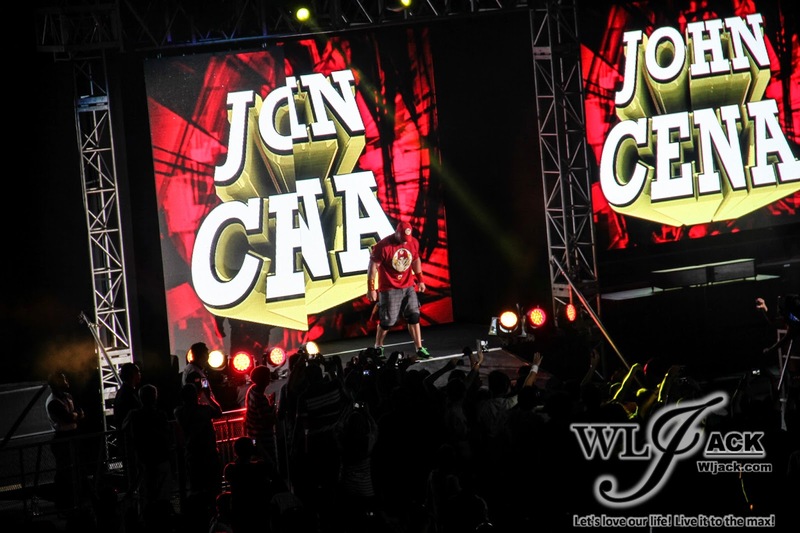 Cena then teased a match with Bray on the second day of WWE in Malaysia! And he said that WWE Wrestlemania will be here on Day 2! Apart from all of the amazing fights, another amazing thing about WWE in Malaysia 2014 was the fans here. Throughout the match, you can hear a lot of unique cheers and boos which can only be found in Malaysia such as, “Cena Sini..”, “Baliklah, Loser!” and even an “Ole Ole Ole” (the football anthem, not the Los Matadores’ theme song)!